The economy of Saudi Arabia is centred on the country’s enormous petroleum resources. 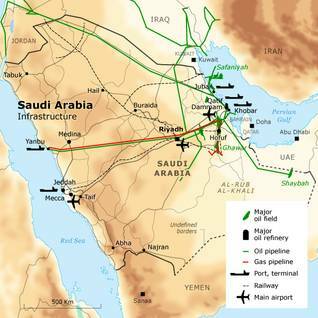 (Although Saudi Arabia also has large natural-gas reserves, the gas sector has been less important to the country’s economy, and Saudi Arabia is not a natural-gas exporter.) Since the 1970s, the country has been the world’s largest crude-oil exporter, and it possesses the world’s largest proven conventional crude-oil reserves (estimated to be about 20 percent of the world’s total proven crude-oil reserves). Saudi Arabia’s unique ability to bring on or cut large amounts of crude-oil production (and hence exports) means that no other country has as much voluntary influence on the world crude-oil market; Saudi Arabia is thus referred to as the world’s ‘swing producer’. Within the Organization of Oil Producing and Exporting Countries (OPEC), of which it was a founding member, Saudi Arabia is of paramount influence, as other members are significantly smaller producers and have less ability to manipulate production voluntarily. The gross domestic product (GDP) for Saudi Arabia in 2011, using official exchange rates, was USD 577.6 billion. Using purchasing-power-parity (PPP) exchange rates, which give a better idea of comparative consumption levels between countries, the country’s 2011 GDP was USD 691.5 billion, with an annual per capita income of USD 24,500 (PPP). Gross domestic product (GDP) in 2015 was $646 billion, compared with $753.8 billion in 2014 and $744.34 billion in 2013. GDP is predicted to grow in 2017 by 3.4 per cent, compared with 2.6 per cent in 2016 and 3.7 per cent in 2015. In 2015, GDP per capita was $20,583. The International Monetary Fund (IMF) projects inflation in 2017 to be 2 per cent, compared with 2.2 per cent in 2016 and 4 per cent in 2015. Saudi Arabia ranked 29th in the Global Competitiveness Report 2016-2017, down from 25th place in 2015-2016. The decline in oil prices is considered among the biggest challenges facing the Saudi economy. This has motivated the government to adopt a number of measures aimed at safeguarding the country’s long-term growth capabilities and financial sustainability. These include imposing a 2.5 per cent tax on o undeveloped land and introducing a $23 airport tax for international passengers, 5 per cent VAT and additional taxes on tobacco and soft drinks. The price of fuel, gas and water will also be raised. These measures followed the announcement on 25 April 2016 of Saudi Arabia’s Vision 2030, an ambitious economic plan intended to position the kingdom as ‘the heart of the Arab and Islamic worlds, the investment power house, and the hub connecting three continents’. Despite being long on rhetoric and short on detail, the plan aims to increase transparency and government efficiency, decrease government spending, e.g. by reforming subsidies, and increase government revenues through the partial sell-off of state-owned enterprises such as oil company Saudi Aramco. Although the World Bank praised Saudi Arabia’s transition from an ad hoc to a medium- to long-term strategy to counter the challenges posed by the new reality of oil markets, it warned that a failure to ?? may make the reforms partial and uncoordinated among the various entities tasked with executing them. Saudi Arabia has the largest economy in the Arab world and the second-largest economy in the region, after Turkey. The other five countries of the Gulf Cooperation Council (Bahrain, Kuwait, Oman, Qatar, and the UAE), however, all have higher per capita GDP. Inflation was about 5 percent in 2011, similar to that of 2010. External debt was estimated at USD 105.9 billion at the end of 2011, which is about 18 percent of GDP. The kingdom had a positive current-account balance of USD 144.2 billion for 2011 (exports USD 359.9 billion, imports USD 117.4 billion). Foreign direct investment (FDI) in Saudi Arabia was USD 214.7 billion at the end of 2011, and Saudi-owned entities possessed USD 18.16 billion in FDI abroad. Economic growth rates are heavily dependent on world oil prices, with real growth rates of 6.8 percent in 2011 and 4.6 percent in 2010, compared with 0.1 percent in 2009. The expansion of oil production and the rise in oil prices in the 1970s increased per capita economic growth by an astounding 1,858 percent in that decade, taking the country from poverty to riches. Growth rates have been more moderate since then. The average per capita growth rate was 3.9 percent for the period 1990-2010. However, the influx in oil revenues did not immediately translate into human-development levels equivalent to those of other countries with similar per capita incomes, as it has taken time to develop infrastructure, government services, and markets. In 2011, the kingdom ranked 56th in the world in the United Nations’ Human Development Index, at 0.770. This places the country above the UN’s minimum index of 0.742 for ‘high human development’, but Saudi Arabia is still not ranked ‘very high’, as are the richest countries of Europe, North America, East Asia, and Oceania. Saudi Arabia ranks low on the UN’s Gender Inequality Index, at 135 out of 187, which suggests that opportunities for female Saudis are significantly constrained. Since the 1970s, the Saudi government has intended to diversify the economy away from crude-oil exports alone, and more broadly, from the petroleum sector. The result is the increased contribution of non-oil sectors – up to 73 percent of total GDP in 2011, compared to 46 percent of the GDP in 1970, according to the Saudi government. This probably, however, reflects a limited conception of the oil sector that does not include even directly related activities and may exclude even the rest of the sector beyond crude oil. By some measures, oil underlies a much larger percentage of the economy. Other statistics are indicative: in 2011, for instance, oil and refined petroleum-product exports totalled USD 317.9 billion of GDP, according to official exchange rates, which represents more than half of GDP. The US Central Intelligence Agency states that the petroleum sector accounts for 45 percent of GDP. Whatever the exact contribution is, it is no exaggeration to say that without the oil sector and its related industries, the Saudi economy would collapse. Examining the role of oil revenues in government finance makes this clear: in 2011, government revenue represented 49.9 percent of GDP, and and nearly all of that consisted of oil revenues, at 46.2 percent of GDP. As for other sectors of the Saudi economy, in 2009 agriculture represented 3.2 percent of GDP, industry 60.4 percent, and services 36.4 percent. Fueled by enormous revenues from oil exports, the economy boomed during the 1970s and 1980s. Unlike most developing countries, Saudi Arabia had an abundance of capital, and vast development projects sprang up, turning the once underdeveloped country into a modern state. Because of the undiversified economy and strongly contrasting backwardness of the non-oil sectors during the first few decades of oil production, a command-economy model, instead of laissez-faire methods, was used to achieve economic development. During that early period, unemployment (of the small native population) was all but non-existent – many foreign workers were imported to do the most menial and the most highly technical tasks – and per capita income and per capita GDP were among the highest in the non-Western world. Long-range economic development has been directed through a series of five-year plans. The first two five-year plans (1970-1975 and 1975–1980) established most of the country’s basic transport and communications facilities. Subsequent plans sought to diversify the economy and increase food production; improve education, vocational training, and health services; and improve communications routes between the different regions of the country. But the economic boom was not without a price. As world oil-prices stagnated later in the 1980s and into the 1990s, government policies encouraging larger families led to a large increase in population, so that per capita GDP in real terms actually began to fall, and the kingdom’s young, more educated workforce began to face high rates of unemployment and underemployment for the first time. Extremely low oil prices in the late 1990s began to strain the social compact of extensive economic benefits that carried with them little democratic accountability, and the Saudi government took on debt to maintain spending. Those trends reversed as oil prices rose again, in part because of Saudi efforts to restrain production. In addition, five-year plans were directed toward increasing the share of private enterprise in the economy in an effort to move away from dependence on oil exports and to generate jobs. By the late 1990s, privatization of parts of the electricity and telecommunications sectors had begun. Oil has largely transformed Saudi Arabia from an agricultural and basic-trade economy into a powerful oil-based one. From ancient times to the 1930s, the inhabitants of what is now Saudi Arabia were Bedouin relying on livestock for survival or farmers and traders residing in a few towns, with some fishermen and, later, pearl divers, along the coast. Much of the Arabian Peninsula was, until World War I, under the loose suzerainty of the Ottoman Empire, with a patchwork of local rulers. The modern Saudi state was not founded until 1902 and at first consisted only of the interior region of the Najd, with a small population and an insignificant, poor, pre-modern economy. 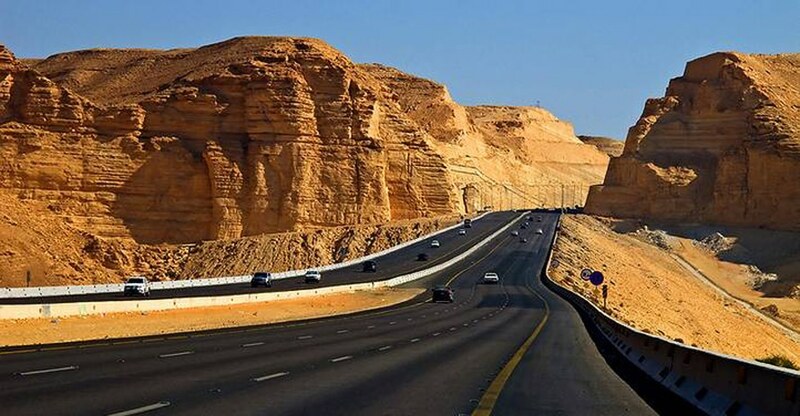 The Red Sea coastal region of what is now Saudi Arabia was the Kingdom of the Hijaz, important for the pilgrimage of many thousands of Muslims visiting the holy cities of Mecca and Medina during the month of the Hajj. This was the main source of revenue for the government, and after it was conquered by Saudi forces in the 1920s (when the borders of Saudi Arabia were established), this revenue became a mainstay for the new country. The Ottoman Empire had completed one major piece of economic infrastructure in 1908, opening a railway from Damascus to Medina, but most of the rest of the interior of the peninsula remained inaccessible and pre-modern. In addition, the population was very small throughout the first half of the 20th century: even in 1950, Saudi Arabia’s population was only 3.1 million in a territory slightly larger than that of Mexico and about three times that of France. The majority of the population remained nomadic up to the 1960s. Given the arid and infertile nature of the land, only a small population could be supported without the massive food imports, desalination plants, and subsidized, energy-intensive agriculture that characterize the country today. In 1933, King Abdulaziz Al Saud (referred to in the West as Ibn Saud) granted a concession to the Standard Oil Company of California (SoCal) to explore for oil in al-Ahsa province, after the discovery of oil in neighbouring Bahrain the year before. The company was initially unsuccessful (there had been smaller, poorly-funded exploration efforts starting in the 1920s). In 1938 the Americans finally struck oil near Dammam. 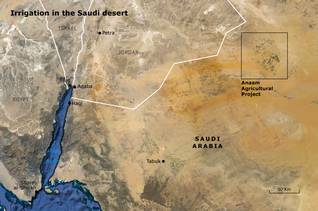 Shortly thereafter, several other discoveries were made in the area, and the company and the Saudi government realized that the crude-oil reserves were very large. Crude oil was exported by 1939, and production reached 15,000 barrels per day (bpd) in 1940. In 1944 the name of SoCal’s local subsidiary, California-Arabian Standard Oil Company (CASOC), was changed to Arabian American Oil Company (Aramco). World War II slowed the development of the sector, but it expanded rapidly beginning in 1945. That year, a modern refinery was built at Ras Tanura, and by 1949 Saudi Arabia was a major producer, at 500,000 bpd. Because world oil prices were moderate until the early 1970s, revenues increased at a steady pace, in line with production increases. The Tapline export pipeline to the Mediterranean came online in 1951, and production reached 1 million bpd by 1954. The largest oil find ever (the Ghawar field) was identified in 1957. Saudi Arabia is one of the founding members of OPEC (1960). The organization at first exerted only a modest influence on world oil prices. However, production continued to increase, as offshore fields were developed, and by 1965 production reached 2 million bpd. Meanwhile, Saudis become steadily more involved in the management of Aramco. Massive infrastructure was built in the late 1960s and early 1970s in order to load supertankers offshore, to produce natural-gas liquids (NGL), to produce offshore, and to refine more oil. The Saudi government purchased a 25 percent share in Aramco in 1973 as the country grew more assertive in controlling its resources. In October 1973, the Arab members of OPEC decided to raise prices dramatically and then to embargo oil exports to the United States and the Netherlands (because of their support for Israel in the 1973 war) and cut production by 5 percent to raise global prices. Prices quickly quadrupled, and export revenues boomed. Although the embargo ended in March 1974, prices remained high throughout the decade and rose even higher with the 1979 crisis in Iran. However, this situation stimulated production outside of OPEC, as did other initiatives taken to deal with high prices. Saudi Arabia thus also increased production to regain market share. 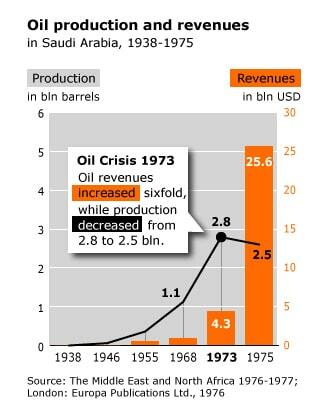 In 1982, world oil prices collapsed, and, although prices would increase later, including in recent years, the substantial growth of the kingdom’s population has meant that per capita oil revenues have never returned to the heights of the 1970s and early 1980s. OPEC, at least collectively, did not return to using oil to pressure consuming countries on unrelated political issues. Since the 1980s, Saudi Arabia has been one of the less aggressive members of OPEC regarding world oil prices (a so-called price ‘dove’), adjusting output to ensure sufficient revenue for political stability in the kingdom but not so much that alternatives or high-cost production elsewhere is unduly encouraged. Security concerns – initially concerning the Soviet Union and later regarding neighbours Iraq (under Saddam Hussein) and Iran (since the Iranian Revolution) – and close ties to the United States have also influenced Saudi policy on oil production. At the same time, the Saudi government has maintained full control of Aramco since 1980 (the company’s name was changed in 1988 to Saudi Arabian Oil Company or Saudi Aramco). As the world’s largest oil exporter for decades, accrued petroleum revenues are in the USD trillions. country’s dependency on oil by diversifying the economy; this has been an important policy goal of the Saudi government. Government policy today focuses largely on economic development, prioritizing the reinforcement of economic growth in the face of the global economic slowdown. This slowdown carries the risk of lower oil prices, particularly if emerging economies that have so far avoided the downturn affecting many mature industrialized countries – such as China, India, and other growing Asian economies – were to reduce the growth of petroleum demand. This demand has sustained high oil prices, despite stagnant or declining demand in the Organization for Economic Co-operation and Development (OECD). Oil prices have remained higher in recent years also because of political events such as the Libyan civil war of 2011, which disrupted production in that OPEC country. The government is investing in the large-scale expansion of crude-oil production (in part to compensate for declines in older fields), refining capacity, and natural-gas production, while also developing the non-hydrocarbon economy, in order to reduce the country’s dependence on crude oil and gas and to foster job creation. Nevertheless, by 2007 the non-hydrocarbon industry contributed just 10 percent to Saudi Arabian GDP and less than 6 percent to total employment. Several interrelated factors support the strategy for Saudi development. The advanced infrastructure and services are of value for future expansion. Most Saudi Arabia’s regions are connected by highways and airports. The country has good access to electricity, drinking water, sanitation, and a distribution network for oil products, as well as health, education, training, and social and other services. Two industrial cities have been built, in the cities of Jubail and Yanbu (both initiated in 1975), to house new refining, petrochemical, and shipping industries. The Jubail II project (USD 3.8 billion) will further expand industry and related services for the population. Four more economic cities are planned: King Abdullah Economic City in Rabigh, Prince Abdul Aziz bin Mousaed Economic City in the Hail region, Knowledge Economic City in Medina, and Jazan Economic City, in the province of Jazan. The Saudi Arabian General Investment Authority (SAGIA) estimates that, by 2020, the combined contribution to GDP of the four new cities’ economic activity will be USD 150 billion per year. Another raison d’être for these cities is to spread economic development to other regions of the kingdom. 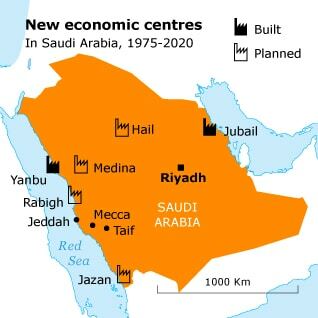 Economic development and – because of internal and external migration – population, have up to now been concentrated in just three of the kingdom’s thirteen provinces: Riyadh; Eastern, which contains most of the country’s oil fields, petroleum industry, and Persian Gulf coastline, as well as most of the Shiite minority in the country; and Makkah, which contains the second-largest city, Jeddah, and the holy pilgrimage city of Mecca. The strategic geographic position of Saudi Arabia – close to north-eastern Africa, western Asia, and South Asia, and having networks of airports and sea ports – gives the country great potential in air, sea, and land transport. Indeed, neighbours such as Dubai have capitalized on this location to a much greater degree than Saudi Arabia, in part because government support for such initiatives has been greater but also because they are more open in terms of visas and transit and more tolerant of different cultural practices. The near-term outlook is generally good for Saudi Arabia: it finds itself in a strong macroeconomic position, with current-account and budget surpluses and strong economic growth. But there is also an element of longer-term uncertainty, as a weak global economy and other changes that could depress global oil demand and price would put Saudi Arabia in a much weaker macroeconomic position. At the same time, the unemployment problem continues, and government policies that reduce the problem (such as massive government employment) or that soften the blow (such as unemployment and other subsidies) might be more difficult to sustain if the government found itself in a weaker fiscal position for several years. For an in-depth overview of Saudi Arabia’s energy sector click on the button below. The service sector grew dramatically in the second half of the 20th century, with the revenue derived from petroleum sales and because of high levels of government spending. 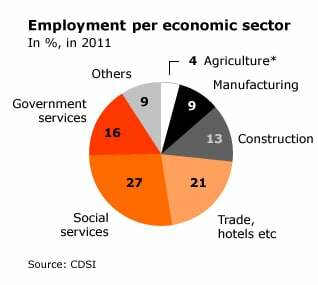 About 70 percent of the labour force works in the service sector, including civil administration, defence, construction, wholesale and retail sales, and hospitality and tourism. Oil and gas production, due to their capital-intensive nature, contribute far less direct employment than their shares of the economy, making a productive services sector key to providing sufficient employment. As the Saudi economy has advanced and become more sophisticated, there has been more demand for professional services such as banking, telecommunications, information technology, legal, health care, and marketing. In advanced economies, the service sector (also known as the tertiary sector) usually represents more than 50 percent of the labour force. However, demand for low-skilled services has also risen in the late 20th century, with the growth in Saudi median income in such fields as retail sales, servants, nannies, and manual labour, particularly in construction. The high-skilled and low-skilled parts of the tertiary sector have both presented challenges in Saudi Arabia: the former because of sometimes insufficient human capital arising from deficits in education, training, and experience; and the latter because of cultural and societal issues related to relatively poorly-paid manual labour and to appropriate roles for women. In a society that has become rich and in which extended families retain financial responsibility for other members, it is often considered inappropriate for a Saudi man to work as a manual labourer because he has few career prospects, even though he has had some education. Hence, many unskilled male labourers are imported, largely from South Asia. Women already face restrictions, even in professional work (though there has been some progress on this in the past two decades), but conservative families often oppose a woman’s employment outside of the home. Since the 1970s, there has also been a large expansion of government employment due in part to the growth of the state. The Saudi state has much more comprehensive and sophisticated services than in the early 1970s, and a modern bureaucracy has largely taken the place of more traditional governmental and juridical structures that co-existed with a largely nomadic population. Rapid population growth has also provided a continuing impetus for the growth of the state. Some of that growth has been due also to the need to provide employment for a Saudi population that is often either unqualified or unwilling to do certain kinds of private-sector work, particularly in the services sector. This means that a huge percentage of the budget is devoted to paying government wages – more than 30 percent, even approaching 40 percent. Approximately 80 percent of employed Saudis work for the government (this figure may include state-owned companies). These two trends appear unsustainable in the long run. 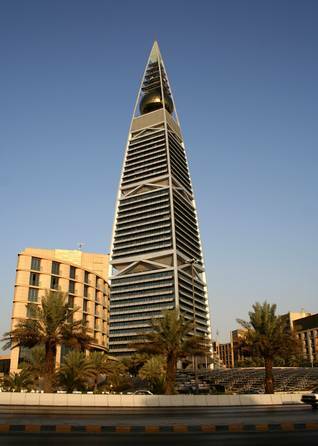 The Saudi Arabian Monetary Agency (SAMA) was established in 1952 as the central bank for Saudi Arabia. Previously, the kingdom depended on a Dutch bank to carry out central-banking functions in what was then still a fairly underdeveloped economy with a poorly coordinated monetary policy. SAMA was assigned several functions, including the issuance of national currency; acting as a banker to the government; supervising and regulating commercial banks; managing the kingdom’s foreign-exchange reserves; conducting monetary policy for promoting price and exchange-rate stability; promoting economic growth; operating cross-bank electronic financial systems; and ensuring the soundness of the financial system. Although it took several years for SAMA to develop the capacity to manage the monetary system, it has since become one of the world’s more competent central banks. The Saudi currency, the riyal, is pegged to the US dollar, although SAMA let it float briefly in 2007, because lowered interest rates in the United States raised concerns that the riyal might drop in value more than desired. The peg forces SAMA to mimic the US Federal Reserve’s interest-rate policies so as to not put the riyal under pressure. This is not, however, always ideally suited to Saudi economic conditions, as, for example, when the Fed maintains low interest rates in response to a slow US economy, while Saudi Arabia might be experiencing an oil-price boom, which can cause overheating in the Saudi economy. An advantage, however, is that it prevents the riyal from appreciating in response to oil booms, which would negatively impact the kingdom’s non-oil exports (e.g., the so-called ‘Dutch disease’). Saudi Arabia’s banking sector is characterized by a benign operating environment; low levels of problem loans (one of the lowest in the world); a strong loss-absorption capacity, underpinned by high capital buffers and solid profitability; and a stable, low-cost deposit base and ample liquidity. There are, however, high loan and deposit concentrations, and there is often a lack of transparency in businesses indebted to the sector. There are fewer than twenty main commercial banks in Saudi Arabia, and the situation is oligopolistic, with the four largest banks controlling about 60 percent of assets. These four are the National Commercial Bank, al-Rajhi Bank, the SAMBA Financial Group, and Riyad Bank. Some foreign banks have joint-venture subsidiaries in the kingdom. Industry-wide deposits posted a new record at the end of the second quarter of 2012, at USD 0.3 trillion. According to preliminary press releases, during the first three quarters of 2012, Saudi banks increased net-income levels by 12.4 percent year-on-year, reaching USD 10.4 billion, driven by higher banking fees and lower provisioning. In line with good overall economic growth and increased government spending, loans are expected to grow by 15.9 percent in 2012. The increase in lending by Saudi banks has propelled the loans-to-deposits ratio to its highest level in nearly three years, 83.2 percent at the end of August 2012. Saudi Arabia’s interbank interest rate (SAIBOR), the rate at which banks lend each other money, has been rising from 60 basis points in late September 2011 to 97 basis points in mid-October 2012. However, the interbank market remains subdued, due to the low-rate policy of SAMA. Islamic banking – banking compliant with Sharia law that forbids conventional interest payments for loans – is an important part of the Saudi banking sector. Saudi Arabia has one of the world’s largest markets for Sharia-compliant banking products and services. Four of Saudi Arabia’s banks – including one of the largest overall, the largest Islamic bank in the world, al-Rajhi – are fully Sharia-compliant. Saudi Arabia is rapidly increasing the issuance of corporate and sovereign Sharia-compliant bonds, called sukuk. 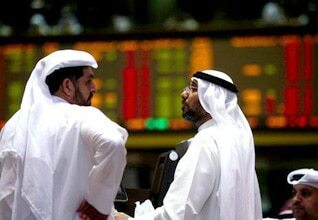 The Saudi Stock Exchange, known as the Tadawul, lists 156 publicly-traded companies in the kingdom. The exchange was formalized in the 1980s and since 2003 has been regulated by the Saudi Capital Market Authority (CMA). The exchange itself became a joint-stock company in 2007. At the end of October 2012, the year-to-date all-share index registered an increase of 5.8 percent (373 points). The highest close level for the index during the month was 6,896, on 10 February 2012. The total equity market capitalization reached USD 366.8 billion at the end of October 2012, an increase of 0.17 percent over the previous month’s close. The total value of shares traded for the month of October 2012 reached USD 24 billion. The kingdom’s development plans have given food production special attention, in an effort to provide some food security, and the government has made subsidies and generous incentives available to the agriculture sector. Agriculture now contributes only a small fraction of the Saudi GDP and employs a comparable proportion of the workforce, but without government support the sector would be even smaller. The aridity of the country and the lack of arable land (only 1.5 percent is arable) would make large-scale agriculture largely uncompetitive with imported food without the massive subsidies and other benefits received by the sector. 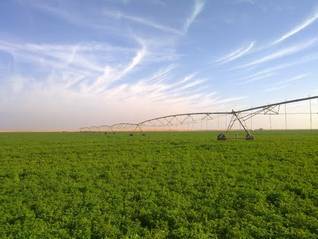 Agriculture uses over 80 percent of Saudi Arabia’s fresh water. Historically, Saudi Arabia’s agriculture was limited to date-farming and small-scale vegetable production in widely scattered villages and oases. The production sustained the local village communities; some vegetables were traded with passing caravans. Bedouin communities generally relied on livestock. In an effort to secure better control of the country, the government began in the late 1960s to pass laws that restricted the movement of nomadic peoples and their grazing livestock. The government began programmes to give land to citizens who demonstrated agricultural development of the land in a prescribed period. In the early 1970s, with the rise in oil revenues, the government launched an extensive programme to promote modern farming, roadbuilding in rural areas, and irrigation technology and to encourage agricultural research and technology. In particular, strategies were developed to advance self-sufficiency in wheat and barley production by offering large subsidies, interest-free loans, and price supports for individuals, projects, and organizations. This was followed by the growth of production of other basic foodstuffs. Water is the main challenge in agriculture, as the country receives only about 106 millimetres of rain annually. A network of dams has been built to capture and use precious seasonal rain. Wells have been drilled to tap underground water resources, and desalination plants are producing sufficient water for agricultural needs. These efforts have helped to transform vast tracts (millions of hectares) of desert into fertile farmland, but these efforts and subsidies have been a large drain on the government budget, which began to cause fiscal stress in the 1980s. As production boomed, Saudi Arabia even began exporting wheat in substantial amounts in the 1980s, until the practice was banned in 1986. Barley and sorghum production also increased dramatically. In 2008, it was decided by the Saudi government that these subsidies, as well as the drastic depletion of water resources (as much as 40 percent of water being used for agriculture) were not justified for wheat production and that the country would instead import wheat. Subsidies, which had already been lowered, will be reduced further. Wheat production fell from 2.55 million tonnes in 2007 to 1.3 million tonnes in 2010. Other water-intensive crops used for animal feed, such as alfalfa, will also increasingly be imported by providing import subsidies to livestock farmers. Agriculture is now more focused on increasing yields of fruits and vegetables grown in greenhouses that waste little water and on livestock (including dairy and eggs), as well as dates, which are adapted to the climate. Dates are Saudi Arabia’s second-largest crop, 1.07 million tonnes in 2010. The production of dates, as well as of tomatoes, the kingdom’s third-largest crop at 0.49 million tonnes, has been fairly steady in recent years. The agricultural sector employs slightly more than half a million people in Saudi Arabia. The manufacturing sector has expanded widely since the mid 1970s, when the Saudi Industrial Development Fund (SIDF, 1974) and the Saudi Basic Industries Corporation (SABIC, 1976) were established by the government in order to develop high-value industrial activities outside the upstream petroleum sector and thus diversify the economy. SIDF provides preferential loans for new industrial development and the modernization of existing development and provides technical assistance to Saudi industry. SABIC’s initial goal was to create value-added industries related to petroleum, so that more of the value chain could be retained in the country and in order to contribute to the overall development and diversification of the economy. The initial focus was on petrochemicals, polymers/plastics, and fertilizers. SABIC has since expanded into metals, taking advantage of the low energy costs in the kingdom for smelting and other activities. Unlike the booming upstream petroleum sector, manufacturing has experienced a steady growth. Given Saudi Arabia’s petroleum reserves, the upstream sector will, for the near future, remain at the heart of the Saudi economy, but there has been considerable success in creating a large downstream sector in refining, petrochemical, plastics, and other related industries. Saudi Arabia has made considerable progress in expanding industry unrelated to the hydrocarbons sector, but these sectors are still small, because the kingdom does not generally have a comparative advantage in these areas, except for energy-intensive industries. In 1975, the total contribution of manufacturing to the Saudi economy was USD 4.3 billion, but this figure (using constant riyals, the Saudi currency) had risen to USD 29.5 billion by 2010. The sector has grown faster than the overall economy during this period, its contribution to overall GDP increasing from 4.1 percent in 1975 to 12.6 percent in 2010. These figures include oil refining. Even excluding oil refining (but including petrochemicals) growth was considerable: from USD 2.5 billion in 1975 to USD 23.7 billion in 2010. Of equal importance was the growth in employment. Total employment in manufacturing increased from about 34,000 in 1975 to about 530,000 in 2010. Even industries that are not large contributors to GDP can be important from an employment perspective. For example, food-product manufacturing employs more than 100,000 people. Nevertheless, excluding petrochemicals and refining, the manufacturing sector is still less than 5 percent of GDP, and non-hydrocarbon-related manufacturing exports in 2010 accounted for only 28 percent of the total value of manufactured exports (which was USD 30.8 billion). In part, this is because the refining and petrochemical/polymers/plastics sectors in Saudi Arabia are so large. More than half of the total investment of USD 109.2 billion in industrial facilities by 2010 has been in these hydrocarbon-related sectors. Saudi Arabia has seven domestic refineries, with a combined crude-oil throughput capacity of about 2.1 million barrels per day (bpd), of which Saudi Aramco’s share is approximately 1.1 million bpd. The petrochemical industry is vast but is dominated by SABIC and its joint-venture partners. Saudi Arabia is among the top three producers in the world for most of the main petrochemical products, and Saudi Arabia’s significant natural-gas reserves are being developed in part to support the petrochemical industry (Saudi Arabia does not export natural gas). The kingdom’s enormous production of natural-gas liquids (second-highest in the world in 2011, at 1.6 million bpd) provides a correspondingly high feedstock base. 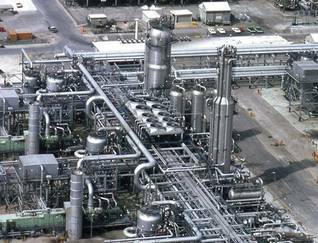 Low-cost feedstocks give the Saudi petrochemical industry a huge competitive advantage. The government is aiming for petrochemicals production of 100 million tonnes by the end of 2016, a 250 percent increase over 2006. This will require investment in the petrochemicals sector of more than USD 100 billion in the next ten years. Tourism in Saudi Arabia is centered on the annual Hajj pilgrimage to Mecca and related pilgrimages at other times of the year, as well as pilgrimages to Medina. The annual Hajj brings about 2.5 million people to Mecca, and the total number of religious tourists to the Mecca and Medina region each year is about 12 million. 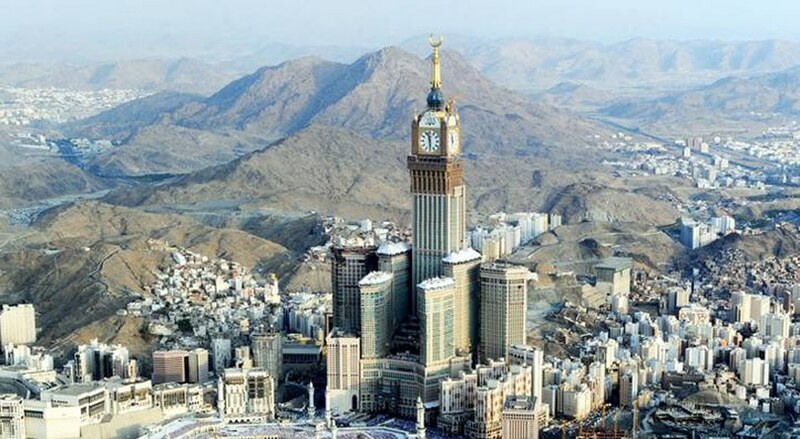 As the pilgrimage is a religious obligation for observant Muslims with the financial means, the potential for growth is enormous, and the Saudi government has made investments in infrastructure and hotels (notably the Haramain High Speed Rail Project and the USD 3 billion Abraj al-Bait Towers complex) to accommodate the growing number of pilgrims. In 2010, total revenue from tourism was USD 17.6 billion, nearly all of which was from religious tourism. Non-religious international tourism was not condoned, let alone encouraged, by the Saudi government until 2000, when the Saudi Commission for Tourism & Antiquities was formed. The severe restrictions on dress, women’s freedom of movement, alcohol, and other aspects of holidaying for Westerners mean that the country will in any case remain a niche market. Visas for individual non-religious tourists remain difficult to obtain, presenting another obstacle to the development of that sub-sector. The Saudi government recognizes that developing the non-religious tourism sub-sector could be an important source of employment, income, and diversification for the kingdom, though the mass-market international tourism that has developed in neighbouring Dubai is not feasible in Saudi Arabia because of greater cultural restrictions. Developing the domestic market would, however, also have positive effects on employment and diversification (compared to spending on imported goods or taking a vacation abroad). The domestic market has grown considerably, and facilities have improved in the past decade. Saudi Arabia has a number of areas of natural beauty, as well as interesting historical sites. pipelines: natural-gas condensate 212 kilometres, natural gas 2,846 kilometres, liquid petroleum gas (LPG) 1,183 kilometres, crude oil 4,232 kilometres, and refined oil products 1,151 kilometres. 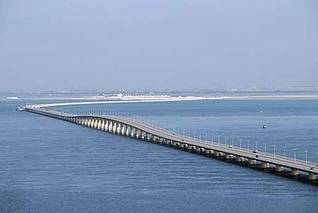 The Saudi Landbridge project (USD 7 billion) creates a freight line between Jeddah and Riyadh. The North-South Railway, which is almost complete, connects the northern border cities of Haditha and Jalamid with the new economic city of Ras al-Khair, on the Gulf. The Haramain High Speed Rail Project will link the Muslim holy cities of Medina and Mecca via King Abdullah Economic City, Rabigh, Jeddah, and King Abdulaziz International Airport. Economic activity is still concentrated in three provinces, and the other provinces still need large infrastructure investment to bring them up to the same level as the most developed provinces. Also, there is some disparity in the very large Eastern Province, with Shiite minority communities in particular complaining of inferior infrastructure (and services) in their communities. The Kingdom of Saudi Arabia has the seventh-largest military expenditures in the world and one of the highest percentages of GDP spent on the military in the world. According to the Stockholm International Peace Research Institute, expenditures in 2011 totalled USD 48.2 billion, equivalent to about 8.7 percent of GDP. This is the highest percentage of GDP spent on defence among the fifteen countries with the largest defence spending. Defence spending provides significant employment, with over 200,000 men under arms, but many weapons systems are imported, particularly from the United States. In 2010, Saudi Arabia agreed to a USD 60.5 billion arms purchase from the United States. Because businesses are not taxed in Saudi Arabia, the kingdom does not have an informal sector that exists for reasons of tax evasion. The fact that the economy is highly developed – with little economic activity outside of the home that is not monetized – is also evidence of a relatively small informal sector. Cumbersome or slow business-registration procedures or a wish to avoid restrictions on employment of non-Saudi nationals do, however, incentivize some informal activity amongst smaller businesses. The large number of servants in the home, particularly foreigners who may not be properly registered, is a significant part of the informal sector. Those working in the informal sector are not counted in official labour-force statistics. According to a World Bank study of several countries carried out in the 2020, the kingdom’s informal sector represented 18.4 percent of the economy, which is typical of an advanced OECD economy. The percentage of the non-hydrocarbon economy would, of course, be much higher. The official unemployment rate in Saudi is about 10.5 percent (September 2012), but Saudi Arabia has a very restrictive definition of the labour force, such that the labour-force participation rate is only about 36 percent. This is due partly to societal and legal restrictions on women working but nevertheless indicates that real unemployment in a broader sense is higher than 10.5 percent. In 2011, when unemployment benefits were introduced (part of a USD 110 billion package to defuse political discontent), about 3.5 million Saudis applied, far more than the 500,000 the government had expected. Some of these applications were unsuccessful, as it had to be demonstrated that the applicant was actively seeking work or was in training, but more than a million Saudis are receiving the benefit. Those who fail training or are unable to secure a job after several attempts will still be able to secure an ‘incapacity’ benefit, which is paid at a rate significantly lower than the unemployment benefit. The unemployment rate for young men is about 30 percent and is even higher for young women. The fact that high birth rates have only recently been reduced means that increasing numbers of youths are entering the labour market every year, presenting an economic challenge. According to the Labour Ministry, the economy needs to provide 3 million new jobs for Saudi nationals by 2015. About 80 percent of employed Saudis work for the government, but it is equally important that about 80 percent of the private-sector labour force consists of non-Saudis. 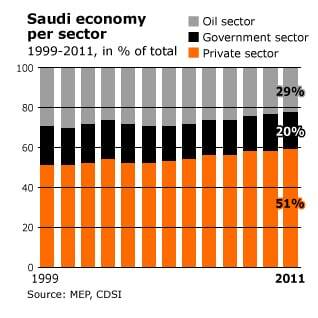 Of 1.2 million jobs added by the private sector between 2004 and 2009, only 280,000 went to Saudis. Part of the reason for this is the wage discrepancy: wages for Saudis are, on average, 3.6 times those of foreign workers. The huge numbers of foreign workers available, often from poorer countries of South and South-East Asia, have, however, driven wages down even for Saudis. This, along with rising housing costs, has caused economic stress in the kingdom, despite booming oil revenues. At the end of 2011, a new programme was introduced to compel private-sector employers to use Saudis, and it seems more effective than previous programmes (the first such programme was in 1994). Called ‘Nitaqat’ (literally, ‘domains’), Saudization had placed 380,000 Saudis in the private sector by September 2012. Some private-sector employers have complained that it is difficult to find qualified workers for certain highly skilled positions. The government is also to limit foreign workers to six years’ employment in the country. A key challenge for the government is to enhance the skills, motivation, and flexibility of Saudi workers so that they can successfully fill positions in the labour market. In any event, many work visas continue to be issued. Saudi Arabia is the second-largest source of remittances in the world, at about USD 27 billion per year. The total number of foreign workers in Saudi Arabia is about 8 million, with 6 million of those working in the private sector. There are a few highly-paid experts, often from developed countries, but the vast majority of foreign workers are in low-skill employment, and some have complained of rampant abuse, with little legal or social protection. ith continued high oil prices, Saudi Arabia has run a current-account surplus in recent years: the preliminary estimate for 2011 is 26.5 percent of GDP. The government is a net lender (for 2011) of the equivalent of 13 percent of GDP (USD 78.6 billion), although excluding oil revenue, the government would be a net borrower of 33.2 percent of GDP. The Saudi Monetary Agency (SAMA, the kingdom’s central bank) had total net foreign assets equivalent to USD 536 billion at the end of 2011, and the country had an external debt of USD 94 billion. 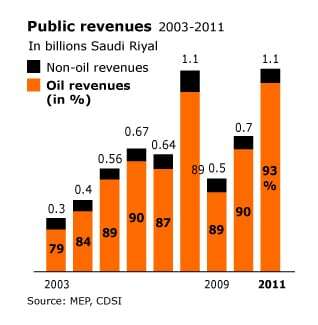 Hence, the kingdom finds itself in a strong fiscal position, though one that is still highly dependent on oil revenues. In the longer term, if oil revenues were to decline significantly, the remaining tax base would be too small to maintain current levels of spending; implementing income taxation, even in a very progressive way, could undermine the Saudi social contract. The fact that growing domestic consumption is eating into petroleum available for export has been compensated for only partially. Although the value of imports increased from USD 97.6 billion in 2010 to USD 120.2 billion in 2011, the value of exports surged on higher average oil prices, from USD 251.5 billion to USD 365 billion. Oil exports (including refined products) represented 87 percent of the value of all exports. Having an open and wealthy but relatively undiversified economy means that increases in income from oil-market boom years are associated with a high marginal propensity to import. Imports increased by about 23 percent in 2011, although real GDP increased by only 7.1 percent (inflation was 5 percent). 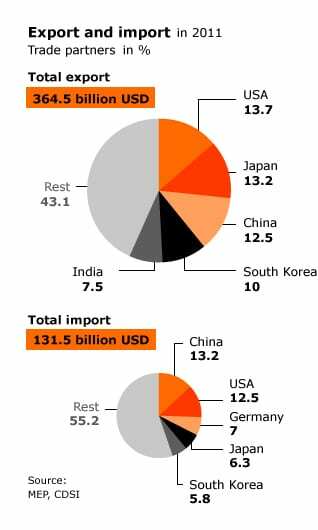 In 2011, Saudi Arabia’s main export partners were Japan (13.9 percent), China (13.7 percent), the United States (13.4 percent), South Korea (10.2 percent), India (7.2 percent), and Singapore (4.9 percent), and its main import partners were China (12.8 percent), the United States (11.9 percent), Germany (7.1 percent), South Korea (6 percent), Japan (5.6 percent), India (5.3 percent), and Italy (4.1 percent). The main imports to Saudi Arabia were machinery and equipment, foodstuffs, chemicals, motor vehicles, and textiles. 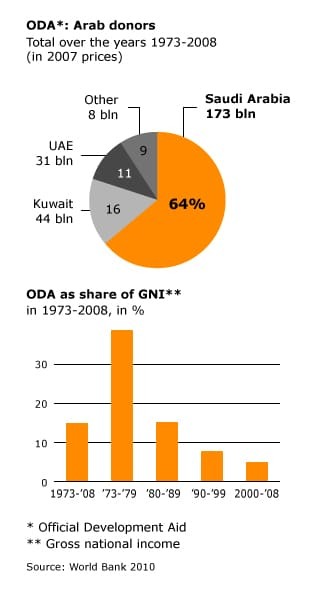 Since the mid-1970s, Saudi Arabia has been a leading donor in terms of both overseas development aid (ODA) and ODA/GNP ratio: disbursements from 1976 to 2006 amounted to USD 49 billion, second only to the United States, and the ODA/GNP ratio averaged 4.2 percent over this period, well above the highest among the countries in the OECD’s Development Assistance Committee (DAC) (the DAC average is 0.35 percent). Saudi Arabia provides aid through various channels, mainly the Saudi Fund for Development (SFD), which acts as the official channel for economic and social development aid. For 2010, SFD disbursed USD 659.2 billion. In addition, Saudi Arabia contributes to multilateral, regional, and international development funds, such as the World Bank, the Arab Fund for Economic and Social Development, the Islamic Development Bank, and the OPEC Fund for International Development. Foreign aid is distributed through soft loans, grants, humanitarian and relief aid, and debt relief (under which more than USD 6 billion of debts of poor countries were forgiven). The Saudi government budgeted USD 189.1 million for foreign-aid grants for 2011. In addition, the government pledged USD 17.9 million in regional aid from January 2011 to June 2012, though only USD 3.7 million had been disbursed. Some controversies associated with Saudi aid efforts include its focus on Muslim-majority countries; its promotion sometimes of very conservative (Wahhabi) Sunni Islam, as practiced in the kingdom; and unofficial aid from Saudi charities that has been linked, at times, to militant groups.